Sony's Spider-Man spin-offs continue to get more interesting by the minute. The studio is currently developing several movies, which will be centered on various characters from the Spider-Man universe, but may or may not actually include Spider-Man. 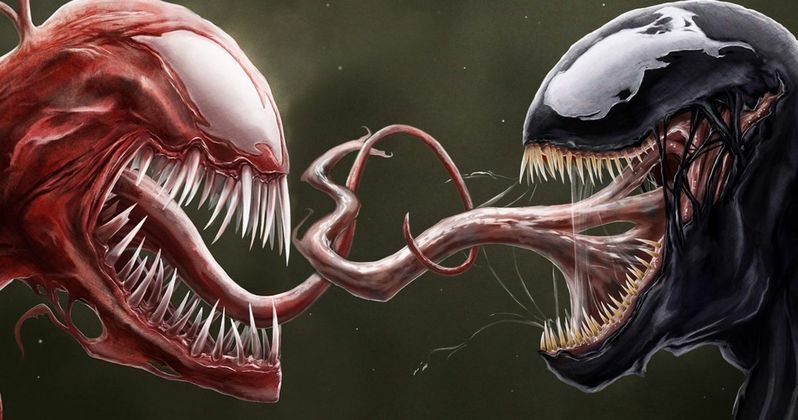 The first of these movies is going to be a possibly R-rated Venom movie that is set for release next year and is to be directed by Ruben Fleischer (Zombieland). Now we know who the villain is, and this is a huge deal. Carnage, aka Cletus Kasady, is going to be introduced on the big screen in the Venom movie. The news comes courtesy of The Hollywood Reporter, who recently spoke with Sony's Tom Rothman about the Marvel Universe they are currently setting up. In the report, some new details about these movies were revealed and easily one of the biggest reveals is Carnage being in the Venom movie. That opens up a whole lot of possibilities and definitely lends credibility to the idea that this movie is going to be R-rated. Here's what THR had to say about it. "As for the expansion plans, Tom Hardy is starring in Venom, dated for Oct. 5, 2018, which will also feature the villain Carnage. A source says Holland is only contractually obligated to Spider-Man 2 and 3, but the intention is to bring him into the spinoffs and possibly other Marvel films (he is currently shooting Marvel's Avengers: Infinity War)." It was hard to imagine a movie in which Venom was the good guy, but this is starting to make at least a little sense. Those who have read Marvel Comics over the years know that Carnage is one of the most ruthless and violent villains around. He makes Venom seem timid in some ways. In the beloved Maximum Carnage storyline, Venom actually teams up with Spider-Man, as well as Black Cat and Cloak and Dagger, in order to stop Carnage. So if there is one villain that could make Venom look a little less bad, it is Carnage. For those who may not be familiar, here is a brief character synopsis for Carnage. "Cletus Kasady became a serial killer. He was then captured and sent to Ryker's Island prison for 11 murders, though he bragged about killing a dozen more, where he shared a cell with Eddie Brock, the host of the alien symbiote that turns into the supervillain Venom. When Brock's symbiote soon returned to be bonded again, allowing Venom to escape prison, the symbiote unknowingly left its offspring in the cell; due to its alien mindset, the symbiote felt no emotional attachment to its offspring, regarding it as insignificant, and thus never communicated its existence to Brock via their telepathic link. The new symbiote then bonded with Kasady, transforming him into Carnage." The THR report also mentions that the Sinister Six movie they were working on was scrapped. That said, by bringing in Venom and Carnage, and with Vulture and Shocker over in the MCU via Spider-Man: Homecoming, which was recently confirmed by Sony's Amy Pascal to be in the same world as Venom, it is hard not to wonder if a Sinister Six movie is being bandied about. The report also mentions Kraven the Hunter and Mysterio, so that would more or less give us the six needed for that. We'll have to wait and see, but for now, we can all just absorb the whole Carnage thing, which is, at least for Marvel fans, significant.